My hallway doors still aren’t completely painted, the cabinets still need repair, the ceiling needs paint touchups, and the light still needs to be reinstalled, but by gosh, the trim and walls are finished!! And yes, I went with stripes. This was one time I was determined to forge ahead with my plan, regardless of how many people questioned it and said, “No! Don’t do it!” And I’m so glad I did. I used the same two colors that I used on my stenciled music room walls — Behr Polar Bear (which I use on all of my trim) and Benjamin Moore Classic Gray (the same color that’s in my breakfast room, living room, and music room). And I was determined to do an odd number of stripes so that I could begin and end with the gray right against the crown moulding and baseboards, so I settled on eleven stripes. Thirteen felt like too many, nine seemed like too few, but eleven looked just right. That put the stripes at about 8 inches high. I’ll share more pictures later this week, including views into the music room, a wider angle view from the music room into the hallway, etc. But for now, I thought I’d share the process of measuring, marking, taping, and painting the stripes so that they’re as close to perfect as possible. 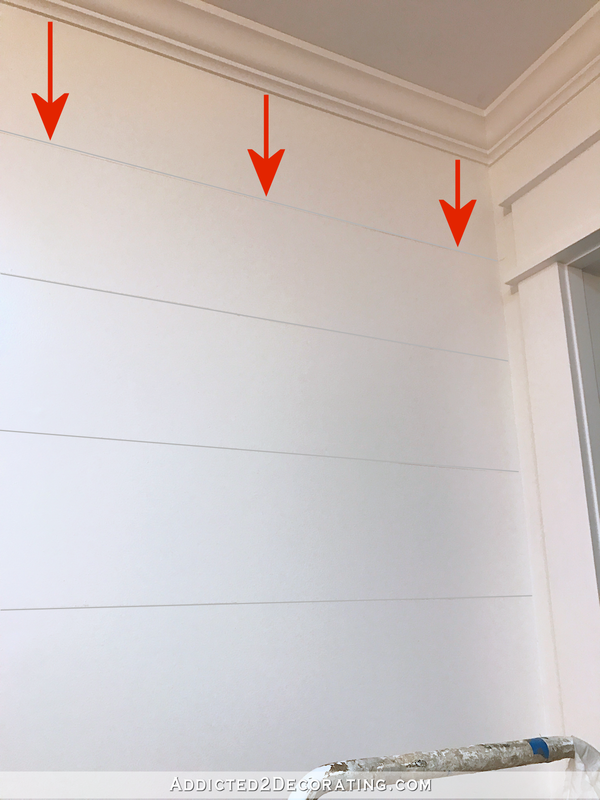 Before any tape goes on the wall, I actually draw the lines directly on the wall. I do not use a regular graphite pencil for this. I don’t know if you’ve ever noticed, but graphite bleeds through latex paint, especially if you’re using light paint colors. It’s nearly impossible to cover up completely, and can be a real headache. 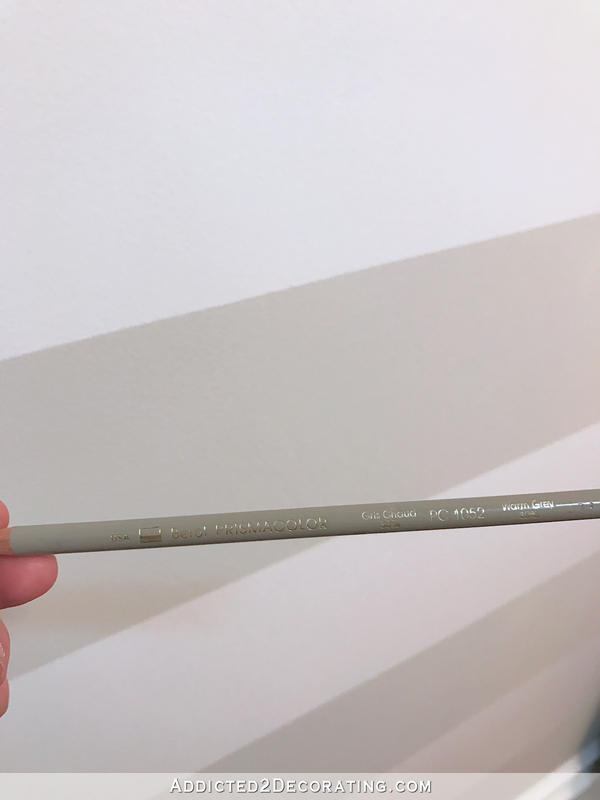 So to draw the lines on the walls, I use a colored pencil — specifically a Prismacolor art pencil, which can be found at Michael’s and other stores that carry art supplies — that is fairly close in color to the paint I’ll be using. For this, I used Prismacolor Warm Gray. I like these pencils because, first and foremost, they’re not graphite and won’t bleed through the paint. But if you get finished with your walls and see that some lines or marks are visible, those can be removed very easily (after the paint is dry, of course) with a damp cloth. 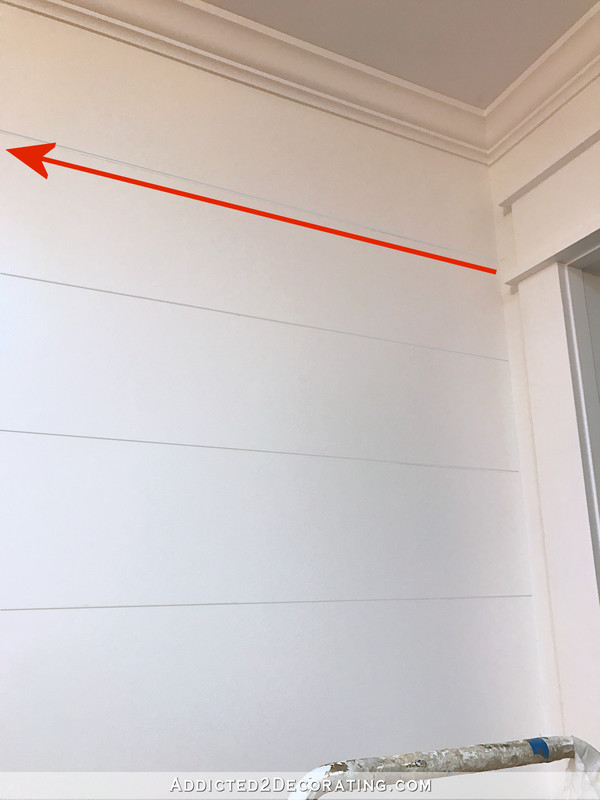 So using my Prismacolor pencil and a tape measure, I measured down from my crown moulding eight inches and placed a mark. I did this about every 16 inches. Then using the longest level I have, I connected those marks and checked for level before using the level as a straight edge to mark the line on the wall. If you have an old house like mine, where nothing is straight, level, or plumb, those marks down from the ceiling or crown moulding probably won’t be in a perfectly level line. In that case, I try to split the difference while keeping the discrepancy within about 1/8 inch. Then I measured down from that first line eight inches, made my marks, and then used my level to connect the marks and check for level and draw the second line. 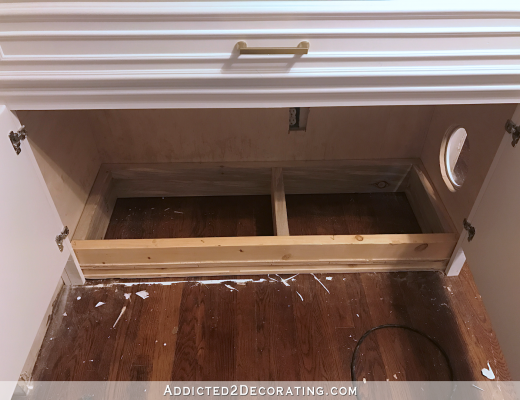 I continued this process down the wall, always splitting the difference on any discrepancies between the eight-inch drop down and the perfectly level line. After all of the lines were marked, I was ready to apply the painters tape. Since my walls had only been painted about 36 hours earlier, I used the blue tape from Home Depot (3M, I think) that’s labeled for delicate surfaces. And I had to keep in mind where my contrast stripes were going to be in order to determine on which side of the line I placed the tape. In reality, I used my colored pencil to make very light “X” marks where the stripes would go, but those didn’t show in pictures, so I placed red check marks on the picture below. So on the areas that would be the contrast stripes, the tape on top goes above the marked line, and the tape below the contrast stripe goes below the marked line. The next step is the most crucial for getting perfectly crisp lines. 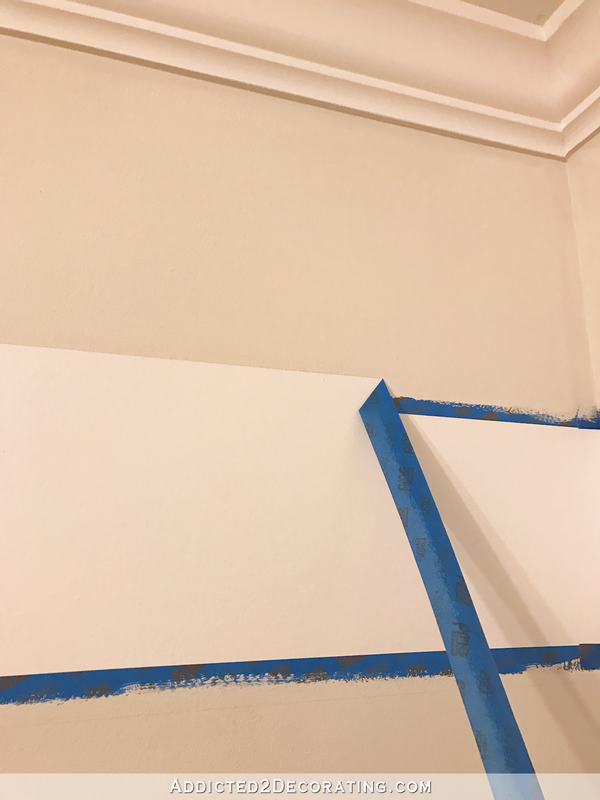 I used my finger to quickly go over the tape and make sure it was really stuck to the wall with no wrinkles or puckers, and then using the wall color (Behr Polar Bear, in my case), I brushed on a thin coat right along the edge of the tape where I would later be painting the contrast stripe color. By doing that, it kind of “seals” the tape to the wall. And if any paint bleeds underneath the tape, it’s the wall color, so it won’t matter. Once that paint was dry (I gave it about an hour), I was ready to paint the contrast color. I cut in along the edges with a brush, and then rolled the large center areas with a 6-inch roller made for smooth surfaces. I had to do two coats on the stripes to get full coverage, but as soon as I painted on the second coat, I removed the tape. So I finally got my stripes. 🙂 And I think the hallway is the perfect place for them. I love them! I was surprised because I envisioned vertical stripes. Surprise! Horizontal and I love them! I bet the hallway looks beautiful with all the surrounding rooms. Happy Thanksgiving to you and all your readers! I love it!! Wish I was as brave as you. I always have horrible luck when using painters tape. It always seems to bleed no matter how tight I think it is to the wall. YOu did a beautiful job. Cant wait to see pics showing the music room also. I agree with Joyce, plus, I was impressed to see the tip to paint over the tape with the wall color first. Genius! Whenever I take a class (usually some sort of art class for me), there’s always at least one little thing to learn that will make alllll the difference, and I think, “THAT’S what I took this class to find out!” Nice work! So fun, but classy all at the same time! Love it! I am happily surprised! It is much subtler than I envisioned. Love it! Why does the light need to be reinstalled? Can’t you just replace the glass that broke? It’s the exact same light, right? The light is not currently installed. It’s just hanging by wires. I removed it from the ceiling so I could paint the ceiling. Those stripes echo the fixture beautifully! And thanks for the tip about painting over the tape with the first color so that the actual stripe color won’t get under it. Genius! Me too! I’m glad I know it now. Thanks, Kristi! And the stripes look fantastic. I’m glad you went with your gut and finished with the stripes. Looks perfect! Gives just enough interest to the hall without being overpowering. Good eye, Kristi! Remind me, when you redid the drywall on all your walls, you kept the surface untextured, right? Do you have any tips for using this process if you have textured walls? I’m sure it’s much harder to get straight lines with texture! It looks amazing! I can’t wait to see it with views of the other rooms. 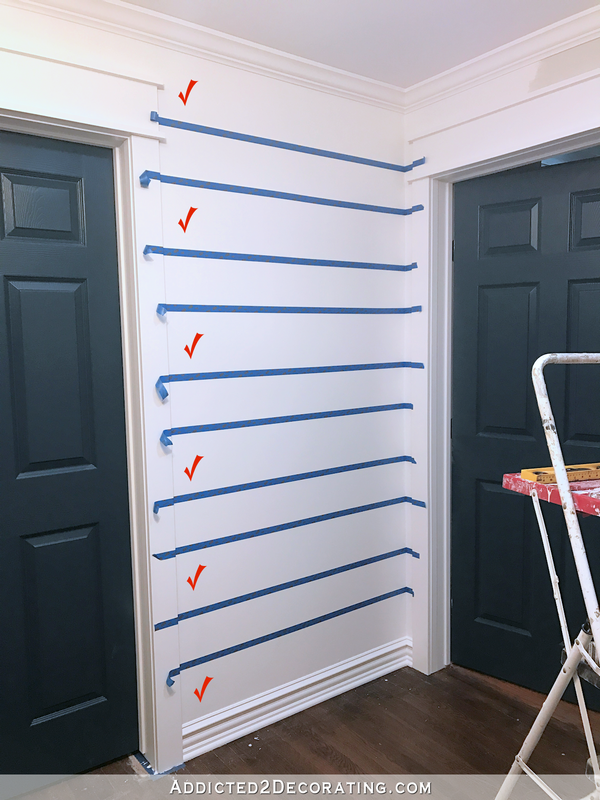 I have textured walls and I’ve done stripes (to transition colors between rooms with no cased entries), and I use the exact method Kristi does: drawing lines with my level, taping it off, then painting the edge of the tape where the new color is to go with the wall color below the tape first to seal it. That way wherever it bleeds, it’s the same color. It’s an extra step but it’s simple and fast and it works every time. I have taught many people this trick because whenever I have new visitors, they always seem to notice the nice lines and comment on it. You are correct. My walls are untextured. But if you have a standard texture on your walls, like orange peel or a light knockdown texture, it should still work. 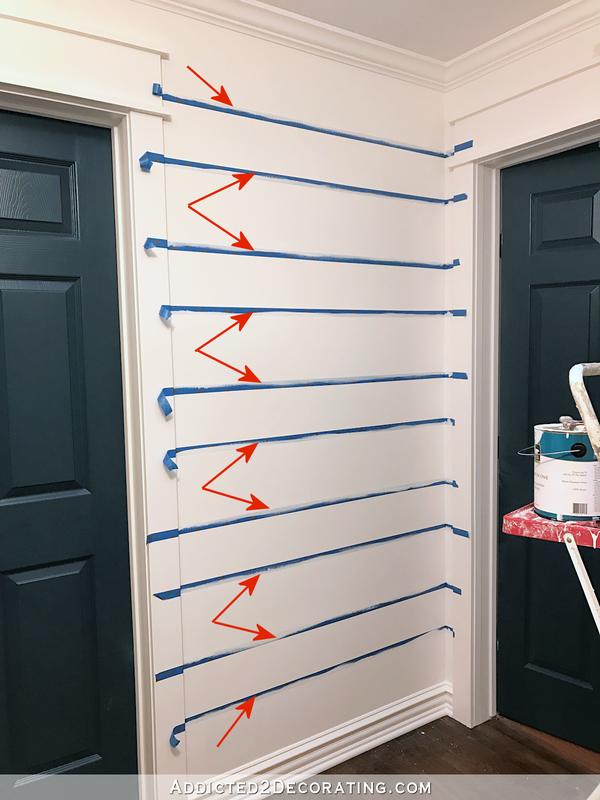 You might have to take more time and care in pressing the tape to the walls before sealing it with the base coat, but the result should still be really good. I’ve always had textured walls until now, and I’ve used this technique several times in other homes with great success. I love it! I’m guessing the horizontal stripes make the area look bigger. I have a small, narrow hallway with 4 door cuts. Maybe that would help open it up. What do you think? Thanks for the primer on measuring, taping, etc. 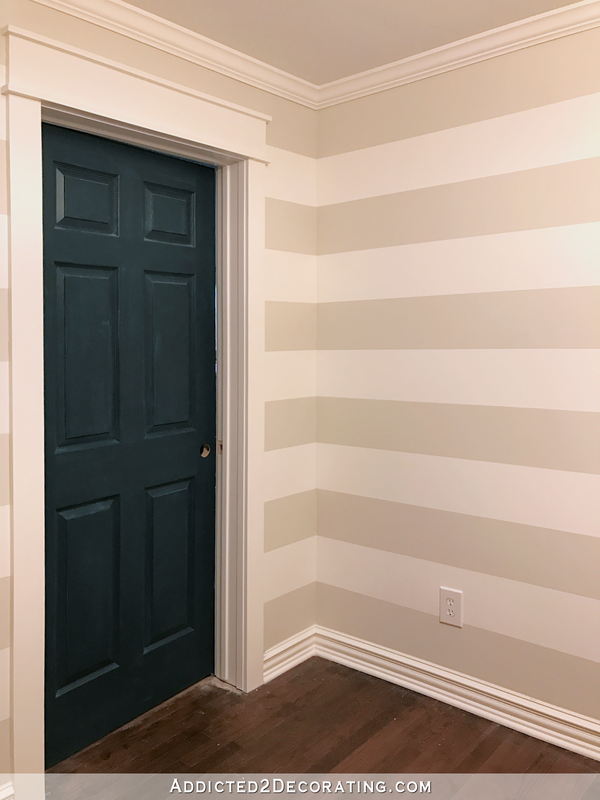 Before doing stripes in a narrow hallway, you might consider looking at pictures of striped narrow hallways on Pinterest and Houzz to see if you’d like it. Narrow hallways would naturally look busier with stripes than my boxy hallway does. I also pictured vertical stripes. Love these. And the color. Looks great. I love stripes too and think it looks lovely. The stripes on the light bring it all together. Excellent job Kristi! I just love how the hall is turning! Can wait to see it with all the decorating bits. I like how the striped frame in the light mirrors the wall design. Looks cool. The stripes mimic the bands on your lighting fixture. Totally AWESOME! I’m glad you went with what YOU wanted. It’s perfect. And I Love how you’ve kept the colours the same throughout and changed things up with patterns. SO NICE! And Fresh. You might consider installing a row of pegs to the wall to the right of the cabinet so that guests have a place to hang their coats. You could paint them the same color as the stripe on which they are installed so they are visually unobtrusive. I was in the ‘yes, do it’ camp……..and I’m so glad you did the stripes which look fantastic. 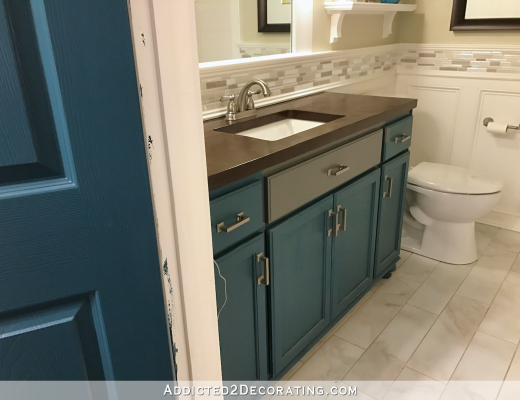 It’s the wow and unexpected visual impact carrying the same paint colors from your music room to your hallway, but in a completely different way. And, how good does the striped light fixture look with the stripes on the walls. Great vision and attention to details Kristi. Well done!!!! I’ve been planning on painting stripes on my hall’s walls, too! I spent the last few weeks looking for the right contrast color, but I also settled on 11 stripes of about 8.5″ width. Can’t wait to get started –especially after seeing how beautifully your stripes turned out! When I do stripes, I paint all the walls completely in one of the stripe colors. That way, I only have to measure and tape off one time. Other than that difference, I use Kristi’s method and they are perfect every time. Loving the stripes! So glad you did them. You have probably told us, but I couldn’t find it–what finish do you use on your trim? I know you use Behr Polar Bear, but is it a gloss finish, or eggshell, or something else? And is it the same finish on the walls and trim? I actually use satin on my trim. The standard for doors and trim is semi-gloss, but I just can’t stand that much shine, so I break from the standard and use satin. 🙂 In the case of my hallway, I also used satin on my walls since I was doing the walls and trim the same color, but my new favorite for walls is Benjamin Moore Aura in a matte finish. That’s what the Classic Gray is that I used to do the contrast stripes in the hallway. It’s also what I used on the breakfast room and living room walls, and it’s what I used for the stenciled pattern in the music room. That’s what I’ll use on all of my walls from here on out. Love it! You are so close to having another room done! Let’s face it that hall is a small room! Lol. Beautiful work as always! Ok. I was wrong. I love the stripes. I thought you were going to do vertical so going with horizontal makes a huge impact. See that – you have to go with your gut and what YOU like. My apologies. The stripes look great. Thanks for the tip on using a matching Prisamcolor pencil. I’ve done the paint the background color on the tape trick before but never thought of using a watercolor pencil even though I have a large set of them. Gorgeous! I like the starting/ending with the gray. Very classy hall! Looks exactly as I envisioned from your stated idea! Gorgeous! So glad you stayed the course! Looks great! I did horizontal stripes several years ago, and snapped a chalk line before putting on the tape. Easy peasy! We all have unique styles. You have to do what you like for your own space. Thanks for the stripe painting tips… the prismacolor pencil info is something I didn’t know, though I’ve certainly had the graphite and paint issue! Gorgeous and unique! Boy, that lamp looks good with those stripes. Love it! The stripes work especially well with your light fixture. When I first read you were going to do stripes, I was dismayed. I thought your hallway had turned out so perfectly. 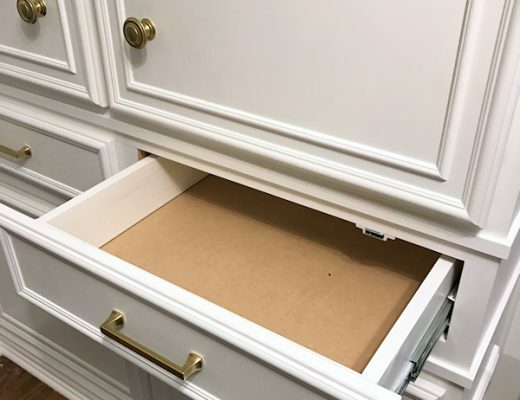 I thought it was going to be too much, with your cabinet with all the trim. But, I’ll have to admit, I love it! Makes your hallway look double the size. Much more subtle than I had thought. Again, you have proven that “go with your gut” is good advice. Especially YOUR gut! Beautiful! Just how I pictured it. The stripes add subtle interest, while letting the doors pop. Can’t wait to see it all tricked out. Beautiful job! I love it! I’ve always wanted striped walls, and I even bought a laser level for that purpose. Unfortunately I haven’t painted them yet. I got the laser level idea from another DIY post I had seen (and can’t seem to find right now…LOL) Is there a reason not to use the laser level? Your way turned out perfect, but seems very time consuming. Thanks and have a blessed day. It’s just personal preference. I don’t find laser level lines easy to follow. They’re thicker and, depending on the level, can be kind of blurry and hard to follow up close. I like a thin, precise line to follow, and find that having a pencil mark actually on the wall is so much easier. Plus, with a laser level, you’re going to get precise level lines. None of my lines are precisely level, and intentionally so, since I was constantly having to split the difference between an actual level line and a precise 8-inch-thick stripe since my floors and ceilings aren’t level. Doing it my way with a bubble level, tape measure and pencil was probably more time-consuming, but it gave me way more control and I feel like I ended up with a better result in my unlevel hallway than I would have with a laser level. Oh, and it was actually a very quick process. It took me two days, but that’s mostly because I was having to tape around five doorways and then had to do so much of the painting by hand with a brush since so many of the areas were too small for a roller. But if I used my method on a wide, uninterrupted wall, it would have taken a day. Amazing. Your applications are making me love stripes more and more. Also…. what technology app are you using to do things like put the red check marks on your photos? I use a photo editing software called Corel Paintshop Pro. I purchased it on Ebay for around $60, I believe. It’s what I use to edit all of my photos for white balance, color corrections, brightness, etc. It’s also what I use to make changes to my house floor plan, although I used a free online site to make the original floor plan. Kristi, the striped hallway is GORGEOUS! I love it, and how it looks very sophisticated and subtle because of the colors you used. I’m curious about the floor plan site that you use. Would you care to share it with us? I’m interested in doing a floor plan and have been unsuccessful in finding an online program or app that’s easy to use and renders a nice plan. Thank you! I used a free online program called Room Sketcher (find it here) to do the initial floor plan. But after that, I used (and continue to use) my photo editing software on my computer (Corel PaintShop Pro, which I found on Ebay) to do any editing on the floor plan. Thank you for the tip, Kristi, much appreciated! I’m eating my words – it looks so lovely! I simply forgot the colors you were planning on using, and this is wonderful! That’s one of the tricks to doing stripes in a small area – keep it subtle. Had you done bolder shades, it would have felt like a cage. Bravo! And I love the tip about painting the tape edge! The stripes look great, but that itty bitty wall in the middle of two doors bothers me. The stripes become checks there and jump out at me. Maybe it’s just that picture and when you see the whole area, it looks cohesive. Anyway, you are the one to please, and I am glad you are happy with your choice. I love it! I have been waiting patiently for you to do stripes somewhere, and it finally came true! 🙂 So glad you didn’t listen to the detractors. You’re practically done with another fabulous room. I find hallways harder to paint than a room – so many edges and narrow spaces. Looking forward to seeing it with the doors all painted. So glad you do you and go with your gut. Looks fab as always. Honestly unless you ask, I would never dream of giving you negative feedback if I didn’t like something. Everybody is different and it is YOUR house. Please consider painting the itty bitty striped area between the doors the sold grey color. It looks odd and as if there are little square painted on the wall as it is now. That wouldn’t make any sense to my eye. Right now, every bit of wall space is painted in stripes. It’s unmistakable when you’re standing in the space or looking in from the music room. If I paint that narrow space a solid color, it would confuse the entire flow of the stripes. Gorgeous, can’t wait to see the art you choose to pull it all together. I’m sure you won’t, but PLEASE don’t paint in between the two doors! That would ruin the whole flow! Awesome! Love the soft horizontal stripes! I’ve been wanting to ask you for some time now about your ceiling color(s). Do you paint them all the same color or does it vary? And what sheen do you use? If they are the same color, what color do you prefer? I continue to be inspired and challenged with your projects and your drive. What a woman! As a general rule of thumb, I use Behr ultra flat ceiling paint on my ceilings. The exception is when I do a special design on my ceiling, and then I’ll use a different color. So my hallway bathroom has a slatted wood ceiling, and it’s stained and polyurethaned. My music room ceiling is also slatted wood with a large dropped down border, and I just treated all of that just like trim and painted it with Behr Polar Bear. But everywhere else — breakfast room, kitchen, living room, and hallway — those are just plain, non-decorative ceilings painted in the ultra flat white ceiling paint. I like that it gives a very difference between the ceiling and the crown moulding. The stripes look awesome, and I appreciate the tips about how to get perfect stripes. I’m glad you’re going to be able to have that particular light fixture as it couldn’t be more perfect with the walls! So lovely! Thanks for the tip on the pencil. I’ve had bleed through too, but I didn’t go through the trouble to figure out why it bled through! I won’t be using graphite anymore! 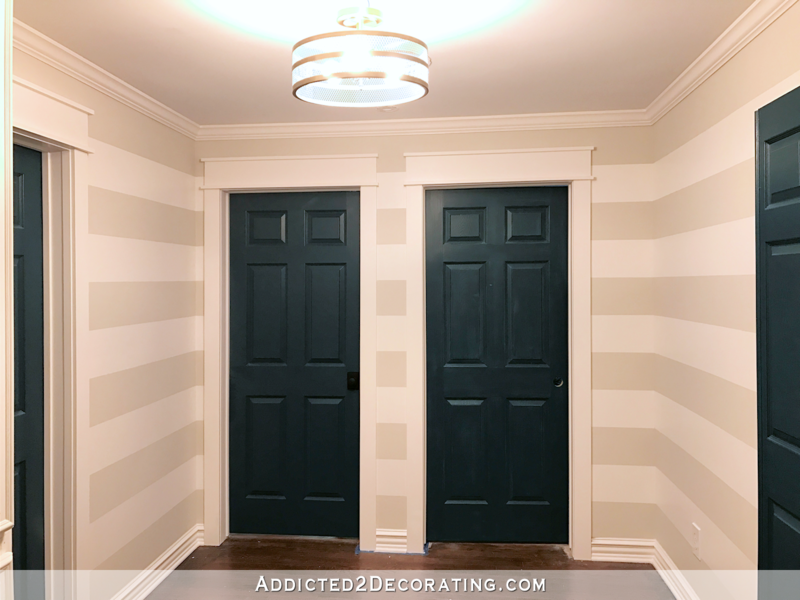 Love the way this turned out, I especially love how the stripes echo the lines of your ceiling fixture fantastic! The only thing that threw me is the narrow strip between your doors. I know that it was meant to continue the stripe, but visually because the area is so small it reads like rectangular blocks of gray in that area. I wonder if it solid gray would work better between the doors. At any rate good job and your gut was spot on! OMG.I love this color. I am surprised that you did it yourself. I cannot do anything like this, making correctly aligned stripes must have been a big challenge for you. well done. thanks for sharing with us. Flawless execution of design Kristi! Now your hallway is a treat and not just a pass-through space. This is so beautiful and elegant but not in a formal, stuffy kind of way. I would not change a thing. You rock, Girl! That’s a lot of work and patience. It looks amazing! I admire your tenacity and stick-to-it-ive-ness. I could barely read about what you were doing. No way I could do it.